OTTAWA — Matt Duchene scored seven seconds into overtime, and the Ottawa Senators rallied from three goals down in the third period for a 6-5 win against the San Jose Sharks at Canadian Tire Centre on Friday. The Senators trailed 5-2 before Derick Brassard (26 seconds), Duchene (8:25) and Mike Hoffman (10:48) scored to send the game to overtime. Duchene broke in and scored off a pass from Hoffman (three assists) for the winner. It was the fastest overtime goal in Senators history. In a 2-1 loss Wednesday, Ottawa allowed a goal at the Detroit Red Wings six seconds into overtime that tied the NHL record. Craig Anderson made 30 saves for the Senators (13-17-9), who had lost two games in a row and won for the fifth time in their past 23 games (5-14-4). Backup goaltender Aaron Dell, who had won six straight starts, made 37 saves for San Jose (21-12-6). Tomas Hertl scored two goals, and Melker Karlsson, Chris Tierney and Brent Burns scored for the Sharks, who have lost two games in a row for the first time since Dec. 2-4. Logan Couture had three assists. “I think we finally got rewarded for the things we’ve been doing,” Duchene said. “We’ve had some tough stretches defensively and offensively, but we’ve been doing a lot of good things for a while and it hasn’t been going in. It’s nice to see that happen tonight, we had a lot of guys step up for us. Brassard scored from along the goal line to make it 5-3. Duchene made it 5-4 of the third on a rebound off a shot by Bobby Ryan, and Hoffman scored his first goal in 15 games to tie it 5-5 on a one-timer. “We turned pucks over,” Couture said. “We didn’t forecheck and we made a lot of mistakes in our own end. We knew they were going to be coming and for some reason we just continued to turn pucks over. San Jose scored three goals in the second period. Tierney and Burns scored power-play goals 1:51 apart; Tierney scored off a rebound in the slot at 2:02 for a 3-1 lead, and a shot by Burns deflected off Senators forward Zack Smith at 3:53 to make it 4-1. After Mark Stone scored his 16th of the season on the power play at 4:59 to make it 4-2, Hertl scored his second of the game on a wraparound off Anderson’s stick at 13:27 to make it 5-2. San Jose is 1-1-2 on a five-game road trip that ends at the Winnipeg Jets on Sunday. Hertl made it 1-0 at 6:29 of the first period when he scored shorthanded on a breakaway. Ryan Dzingel scored on a backhand at 10:05 of the first to make it 1-1. Karlsson made it 2-1 at 12:56. 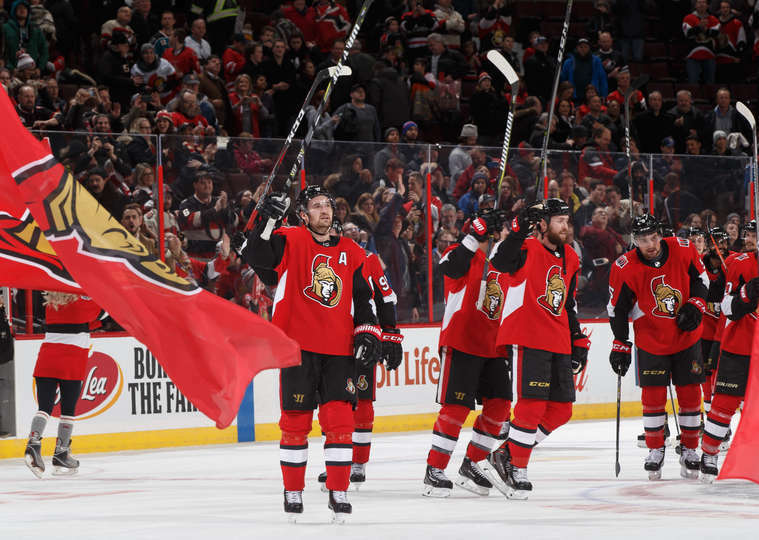 The Senators will host the Tampa Bay Lightning in the second game of a back-to-back Saturday.